Ahh…the Egyptian Zodiac Sign Anubis – head of a jackal, body of a man. Well, maybe that doesn't quite describe how people who fall under the sign of Anubis look, but if Anubis is your Egyptian zodiac sign, you just might find yourself relating to this God's other characteristics. Characteristics of the Egyptian Zodiac Sign Anubis: If your sign is Anubis, you're creative, clever and compassionate. You understand the darker side of life and have a tendency to see reality at its most basic level. You understand life and death, and aren't afraid of either. You are refined and appreciate the best that life has to offer. You exude confidence, determination, and self-control. You might have a fascination with taxidermy or enjoy working in mortuaries or performing autopsies. About the God Anubis: Anubis is the guardian of the underworld and oversees mummfication. It is his duty to find lost souls wandering cemeteries and to help guide them through the realm of the dead until they can persuade Sekhmet to let them into the valley of immortality. It is Anubis' task to test a soul's faith and its knowledge of the Ancient Egyptian gods and goddesses. Anubis placed the soul's heart on the Scales of Justice during the Weighing of the Heart where hearts were weighed against the feather of Ma'at. If the heart was as light as a feather, the soul passed and Anubis would lead them forward. If the heart was heavy, Anubis fed the soul to Ammit. 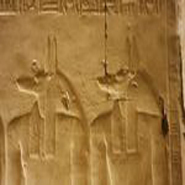 In early myths, Anubis was the son of Ra, and was the original God of the Dead before Osiris “took over” the position. After Osiris became the God of the Dead, Ancient Egyptian Religion made Anubis simply one of the sons of Osiris who guided souls through the underworld.